In order to legally haul hazardous materials in the U.S you must have a DOT Hazmat Employee Certification. TYPE OF TRAINING: This course is an interactive power point with audio and video. Students can come and go from the course as they need and will have 30 days to complete it. DO YOU SHIP HAZMAT VIA FEDEX, UPS, DHL OR OTHER CARRIERS? Many people who are new to working with hazardous materials don’t realize they may have to undergo DOT hazmat employee training for transporting hazmat. This seems to be particularly true among people who ship hazmat through a third-party such as FedEx, UPS or DHL. You don’t actually have to be the person who physically transports hazardous materials from point A to point B to need DOT training. You may simply be the individual who packages, labels, placards or marks the materials. Professionals who receive hazardous materials shipped through a third-party also need to complete HM 181 Department of Transportation hazmat training. Also known as “dangerous goods,” hazardous materials are things that pose a serious risk to health, safety and property during transport from one location to another. These materials fall into nine classes of hazards that include explosives, flammable solids and miscellaneous hazardous materials, among others. While many people think of toxic waste when they hear the term “hazardous materials,” many everyday things fall into the nine hazard classes, such as insecticides, cleaning supplies, aerosols and used paint. 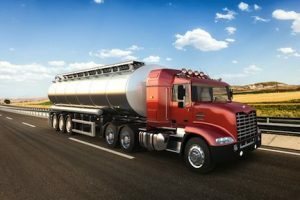 Even if your business ships seemingly harmless things like computers or batteries using a third-party carrier, you and your employees may need DOT hazmat training. If you fail to complete the required training and pass the related exam, your organization may be subjected to fines and/or litigation if an accident or shipping incident results in injuries or property or environmental damage. DO YOU OPERATE A VEHICLE THAT TRANSPORTS HAZARDOUS MATERIALS? If you drive a vehicle that carries dangerous goods, you need to complete initial DOT HM 181 hazmat employee training and ongoing training thereafter. The DOT training requirements don’t just apply to the operators of big rigs. Instead, they apply to all drivers who operate a vehicle of any size, make or model that’s used to transport hazardous materials. DO YOU WANT TO GET YOUR HAZMAT ENDORSEMENT ON YOUR CDL? Unfortunately, we cannot issue you your hazmat endorsement for your CDL. That credential is only available through a state’s Division of Motor Vehicles. While that’s true, our online HM-181 training course for transporting hazardous materials is required in addition to your endorsement in order for you to transport hazmat in the U.S.
DO YOU WORK IN A SHIPPING/RECEIVING DEPARTMENT THAT SHIPS OR RECEIVES HAZARDOUS MATERIALS? Although you may think otherwise, employees who work in a shipping and/or receiving department that handles dangerous goods, signs off on any paperwork or is involved in any way with getting the hazardous materials from point A to B they must satisfy strict training requirements. This online hazmat training course for transporting hazardous materials will help you and your staff members do just that. This simple to take program will help you to understand your role and set up further training programs should they also be required. This HM-181 training course is presented in an easy-to-understand format and is filled with interactive activities, industry-specific examples, and PowerPoints with audio and video to fully ensure you understand the regulations and safety precautions behind transporting hazardous materials. An official DOT certificate documenting compliance with the DOT Hazardous Material training requirement is presented upon completion. This course will also fulfill your tri-annual DOT Hazmat refresher requirement. Do you ship automotive supplies (airbags or seatbelt pretensioners)? You may need our more customized course #1200. Do you select the specific types of packaging for the products you ship? Then you need our packaging course #1205. If you’re planning to launch a new business or career and aren’t sure if you need to earn an HM 181 Department of Transportation hazmat training certification, it’s best to investigate. As an employer, you can minimize the chances you’ll incur fines or face litigation if you and your employees have the required training. If you are a prospective employee who has all the right credentials in place, you may be more immediately employable. Demonstrated some basic functions required for a DOT Hazmat Employee including basic knowledge of the Hazardous Materials Table (49 CFR 172.101), Labels and Placards, and Shipping Papers. The course is designed to be self-paced. You will have 30 days to complete it and can come and go as you need. After one month, you will need to re-enroll. Upon successful completion of the course you will receive an official DOT pdf certificate right away. To comply with DOT and OSHA safety standards, it is required that all employees who work with and around hazardous materials take and pass the necessary training courses. At Hazmat School, we offer the best online HM-181 training possible at the best possible price. We adhere to the strict DOT and OSHA standards to give you the knowledge you need to protect yourself and others while on the job. OSHA’s strict standards dictate that personnel who are shipping or working with hazardous materials must have the knowledge to protect themselves in any situation. After completing our online DOT HM-181 or HM-126 course, you will be prepared for any interaction with hazardous materials. Providing the highest quality learning experiences to over 20,000 students each year, all of our certified instructors strive to individually work with each student to ensure they completely understand and learn the course material. If your job requires you to take an HM-181 training course, let our certified professionals help you get the certification you need in no time. Contact us at 877-OSHA-NOW (674-2669) for details!